I’m late, late, late on this posting, so let’s jump to it. This month’s Gutsy Cook is Marie from Weekend Viands. She decided that all of her recipes would be coming from the Essentials of Classic Italian Cooking by Marcella Hazan. Speaks right to my Italian roots and I was super excited with her choices. This past weekend it was the risotto. I have made it before, my first try was for the Daring Cooks Challenge and I wrote all about it here. The second time was with this choice which, ironically was also a Gutsy Cook club choice. Risotto is one of those meals that people think is super complicated, but in reality is not. 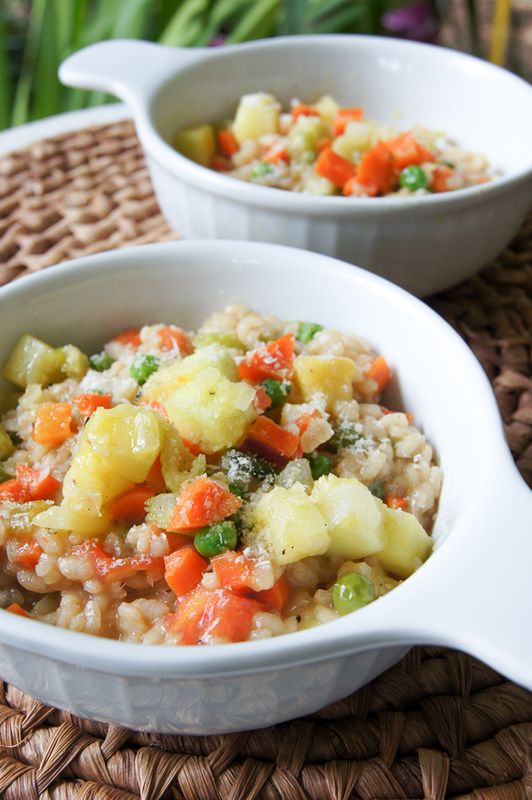 The trick is to take your time, stir and in no time you will have this creamy rice creation – Italian comfort food at its best. Cachapas are thick, tasty pancakes made from maize (sweetcorn) and served with a slab of white cheese called “queso de mano” (hand cheese). These steaming pancakes are then topped with lashing of margarine, a thick slap of cheese, a pork chop and some chicarron, (fried pork rinds) and washed down with a cold Polarcita (beer). Cachapas are an integral part of Venezuela’s culinary history and their origin dates back to pre-Colombian times, when the indigenous population would grind corn with stone pestles and then cook it cachapa-style on clay budares, flat griddle plates that have been found in archaeological digs at many sites in Venezuela. When I was young, Cachapas could only be found in my home state – Bolivar. If that was not enough of a challenge, they were only made by locals in stalls with a tin-roof on the side of the “carretera” (roads) on the way to la Gran Sabana. Most will be grilling chochino (pork) and making fresh Cachapas topped with freshly made queso de mano. Yes, this is a double whammy because you are getting another donut post. After Tom laid praises on the Sweet Potato Donuts, I made the mistake of telling him, that the Bombolini would have been ten times better and he totally dared me to prove it. He knows I cannot resist dates. And I totally fell for it too. I still stand behind my statement before that donuts are not one of my favorite sweets. But the Bombolini holds a special place in my taste memory. See, I have been eating these pillows of fried dough, filled with cream, since I can remember. In Venezuela, my mother would buy a big bag of them as a special treat from our local bakery as I was growing up. My sister and I would gobble them up in seconds, licking our sugar-coated fingers and then wait patiently for the next special occasion to have them.